Bread + fruit = breadfruit! One of the most wonderful things about the South Pacific is the interesting variety of plants. The tropical weather creates a hospitable environment not just for adventurers, but also for plants of all kinds! One of the unique plants that grows across most South Pacific islands is known as breadfruit. Well… it has another name, of course! Scientists call it “Artocarpus altilis.” But anyone who has tasted the starchy, bready meat of this football-sized fruit will know that the name is not undeserved! Breadfruit trees can grow up to 85 feet (or 26 meters) high. That’s pretty high, huh!? Each tree can produce up to 150 breadfruit a year. 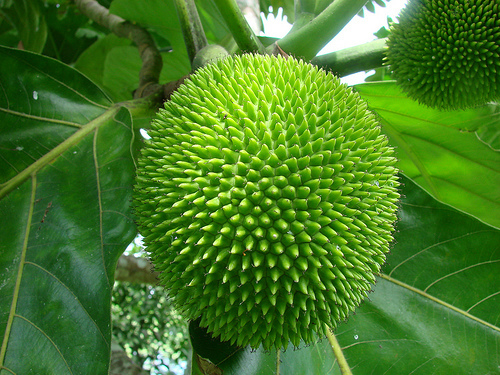 Breadfruit are spiny and green, and are prepared like potatoes. Fried, boiled, baked or roasted — they are best eaten with a little coconut milk! Wash and peel Kuru (breadfruit), dice into 1 inch cubes, place in large stock pot, and cover level with seawater/ salted water. Bring to boil and allow to simmer slowly for 15 minutes. Watch it as it will catch as the water reduces. While on simmer, sauté onions till transparent, do not allow to burn. Add garlic and diced meat and chicken stock to onions, then add to stock pot since kuru cooks very quickly and becomes bulky. Stir pork or chicken in before kuru becomes smooth and pulpy. When kuru is cooked and still holds its shape pour in the coconut cream. Heat thoroughly but do not boil. Serve in bowls with buttered fresh crusty bread. Our children enjoy this dish but always complained because they were always too ‘full’ and it really knocked them out. Ample sufficiency. We are truly in Paradise. Variety makes the going interesting. The influx of traders to the islands brought goods to add to our larder. Dairy products became firm favourites and the canned beef, Punu Puakatoro (beef ). Many adopted the ‘bully beef’. Today we have other canned favourites such as Punu Ika (fish). Other ingredients to add to kuru stew is curry powder or turmeric and ginger. Whatever you enjoy, add to the stew. Meat may be omitted. Try other meats such as salami, cooked bacon or ham, or substitute the pea with kuru when making pea&ham soup. This is a very hearty and satisfying meal. Other starchy vegetable substitutes for this recipe are sweet potato, taro, tarua, yam and rice. Any vegetable may be treated as tiopu. Sliced, beans, green pawpaw, courgette (zucchini), all varieties of cabbage, tomato, aubergine (eggplant), choko. Serve with boiled rice or root vegetable and coconut cream. Yum, yum! I can’t wait to try it!